To put it bluntly, traveling to this national park will allow you to visit two of the world’s most active volcanoes. And that is just plain awesome. Introducing the volcanoes of Kilauea and Mauna Loa...More than 4,000 feet high (and still growing) Kilauea adjoins the much larger and older Mauna Loa which actually means “long mountain.” Mauna Loa is massive, towering 13,679 feet above sea level. In fact, if you measured the volcano at its base, which is located 18,000 feet below sea level, you would realize it is larger than Mount Everest. As if that’s not a reason to visit and awe in all their glory, the park is also equipped with rain forests, tropical wildlife, and breathtaking views. Have you ever honestly heard anything negative about Hawaii? Hawaii Volcanoes was established as the 13th national park in the United States on August 1, 1916. At that time the park consisted of only the summits of Kilauea and Mauna Loa on Hawaii and Haleakala on Maui. 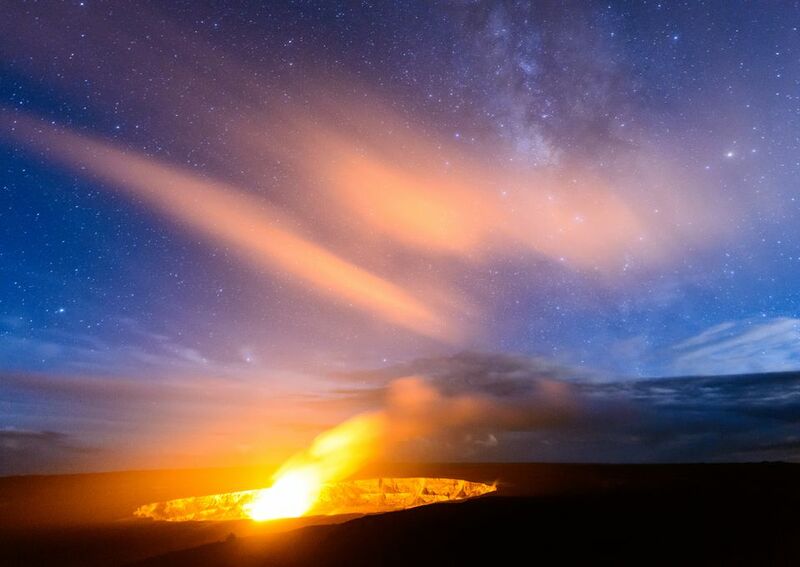 But in time, Kilauea Caldera was added to the park, followed by the forests of Mauna Loa, the Ka'u Desert, the rain forest of Ola'a, and the Kalapana archaeological area of the Puna/Ka'u Historic District. The park is full of historical significance and tales of evolutionary biology. Volcanic wonders, lava trails, giant pits, luscious rain forests, and plenty of wildlife. The park is open year-round so plan your trip according to your desired climate. Driest months are in September and October. Keep in mind that the weather fluctuates depending on where you travel. The climate ranges from warm and breezy on the coast to cool and wet on certain summits. There may be even occasional snowstorms above 10,000 feet on Mauna Loa. Once you fly to Hawaii (Find Flights) you have a few options for local flights arriving in Kailua-Kona or Hilo. From Kona you can head south on Hawaii 11. After 95 miles you will reach the Kilauea summit. From Hilo, take Hawaii 11 to reach the same summit. Along the way, enjoy 30 miles of small towns and rainforests. The park does charge entrance fees: $10 per vehicle for seven days and $5 per individual for seven days. Annual park passes may be used to waive these fees. The park also offer a $25 annual pass that allows one year’s access to Hawaii Volcanoes. Kilauea Caldera: Marking the summit of the Kilauea volcano, this three-mile-wide, 400-foot-deep depression offers a dramatic view. Nāhuku: Also known as the Thurston Lava Tube, this formed when the surface of a lava stream cooled forming a crust while the molten inside continued to flow out. Devastation Trail: Only a half-mile, but this trail is a must-see. You will be walking through a forest killed by falling cinders during an eruption in 1959. Nāpau Trail: If you have time, hike this up Puu Huluhlu to see the amazing view of Mauna Ulu – a steaming domelike hill. Hōlei Pali: Check out the Pu’u Loa Petroglyphs on this cliff. There are two campgrounds within the park, Kulanaokuaiki and Namakanipaio, both of which are open all year and may be reserved for up to seven days. There are no fees to camp and tent sites are available on a first come, first served basis. Two patrol cabins on Mauna Loa Trail and Kipuka Pepeiao may be used for free and are also first come, first served. Visitors must register at Kilauea Visitor Center. Within the park, visitors can choose from the Volcano House or Namakani Paio Cabins to stay. There are many options outside the park for hotels. In Hilo, check out the Hawaii Naniloa Resorts which offer 325 units. In Kailua-Kona, the King Kamehameha Kona Beach Hotel offers 460 units. Also in Pahala, the Colony One at Sea Mountain has 28 condos. Mauna Kea Observatory: As the world’s highest island mountain, Mauna Kea is an unbelievable place to view the skies. The 13,796-foot elevation provides an ideal spot to see the stars, Giant telescopes and guided tours are there for your assistance. Akaka Falls State Park: According to its legend, the god ‘Akaka fled across the canyon, slipped and fell off the 442-foot ‘Akaka Falls after his wife discovered his infidelity. Trails showcase lush jungles and blooming flowers.